The world's most luxurious car for almost a century, Rolls Royce Phantom, is getting an overhaul. It promises to push the envelope further on automotive extravagance. In the world of ever shortening product life cycles, the Rolls-Royce Phantom VIII is a serious outlier. At over 90 years, it is the world's oldest nameplate in cars and, as the numeric suggests, has been updated only eight times, only once every decade. There is no indication that the lifecycle is getting shorter. The current has come in a good 14 years after the previous one in 2003, which incidentally was also when the Phantom got its first truly modern avatar. That itself is reason enough to celebrate the icon, best described as the most luxurious car in the world. But there are other more significant reasons. 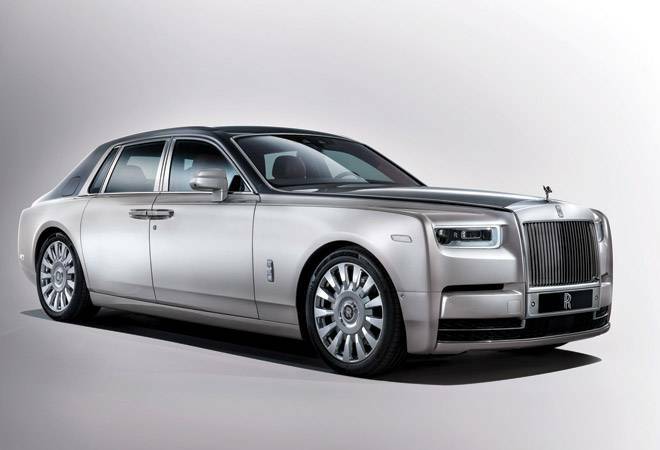 The current edition also happens to be the only time the Phantom has got a holistic update. In other words, it has been designed from grounds up and not based on the outgoing version. So, what can Phantom give what anybody who has Rs 8 crore to spare? Unlike the prevailing trend where even luxury car makers are sharing platforms with mass market nameplates, Rolls-Royce is doing the opposite. Based on what it calls the "Architecture of Luxury", it is an all-aluminium spaceframe architecture, which will be the basis of all future Rolls- Royce cars. Specifically, it will not be shared with even the top-of-the line BMWs, the company that owns the iconic British brand. "This realisation was a moment of clarity about the destiny of Rolls-Royce," says Torsten Muller-Otvos, Chief Executive Officer of Rolls-Royce Motor Cars. "Every one of our customers - each a connoisseur of luxury in the extreme - was asking for something more individual to them, not less." "Key to Rolls-Royce realising its vision of being the world's leading luxury brand is an architecture that spans the entire Rolls-Royce family," says Philip Koehn, Director of Engineering. "The Architecture of Luxury will carry every future Rolls-Royce, not just the new Phantom. Project Cullinan and eventually the next Ghost, Wraith, Dawn, will ride on this architecture, as well as future coachbuild projects." In effect, it will ensure that every Rolls-Royce car will be unique in a way. The new set-up is 30 per cent more rigid than the spaceframe architecture of Phantom VII and yet, thanks to the extensive use of aluminium, only a tad heavier at around 2.7 tonnes. "Phantom VII's spaceframe architecture was a good starting point and inspiration, but we wanted to do much more," says Giles Taylor, Director of Design. "It gives me the canvas to protect the lineage and brand integrity of Rolls-Royce. Starting with the new Phantom, I have the framework to create a future range of true Rolls-Royces." Apart from the increased stiffness, it also gets a best-in-class high comfort chassis with air suspension and state-of-the-art chassis control systems, for unparalleled ride and handling. A new double-wishbone front axle and five-link rear axle deliver astounding control. The company's Magic Carpet Ride has also improved as a result of the new lighter architecture and the latest generation of self-levelling air suspension. The suspension makes millions of calculations every second as it continuously varies the electronically controlled shock absorber system - reacting to body and wheel acceleration, steering inputs and camera information. In addition, there is a stereo camera system integrated in the windscreen to see the road ahead, adjusting suspension proactively. An incredible amount of science has been devoted to making the new Phantom the most silent car in the world. There is a six-mm two-layer glazing all around the car, more than 130 kg sound insulation and the largest-ever cast aluminium joints in a body-in-white for better sound insulation. High-absorption materials are used. Acoustic insulation from road noise has been helped by double skin alloy on areas within the floor and bulkhead of the spaceframe. Noise insulation has also been done by inserting dense foam and felt layers between these skins. High absorption layers within the headliner and in the doors and boot cavity have further aided insulation and reduced reverberation. Rolls-Royce also worked closely with its tyre supplier to invent 'Silent-Seal' tyres; a foam layer is placed inside the tyre to wipe out cavity noise and reduce overall tyre noise by 9db, which means effortless conversation within the car. These have made the car approximately 10 per cent quieter than its predecessor at 100kmph. Each Rolls-Royce car is powered by a 12-cylinder engine. The Phantom has got an upgraded version. To make the most silent car in the world, the output at lower revs has been jacked up. A completely new, 6.75-litre V12 powertrain was engineered in place of the previous V12 engine. The engine employs two turbo chargers that contribute to a low-end torque output of 900Nm at just 1,700rpm while also delivering 563bhp or 420kW of power. It offers substantially higher torque than the outgoing version, which explains why, despite the slight increase in weight, the company claims that it can sprint from 0-60 mph in 5.1 seconds compared with the 5.9 seconds earlier. The addition of Satellite Aided Transmission, married to a ZF 8-Speed gearbox, ensures that the driver is prepared for whatever the road has in store for him. The technology used is mind-boggling. The assistance systems on-board include - alertness assistant, a four-camera system with panoramic view, all-round visibility (including helicopter view), night vision and vision assist, active cruise control, collision warning, pedestrian warning, cross-traffic warning, lane departure and lane change warning, a 7x3 high-resolution head-up display, WiFi hotspot and latest navigation and entertainment systems. Phantom has always laid the marker for luxury in automobiles. What would be talked about the most in the new edition is the "Gallery". It is a reinterpretation of the car's unused expanse in the dashboard and instrument panel area. It is like a canvas that can be used to display anything from a painting, a sculpture made of feathers or jewels. The company has worked with artists, designers and design collectives to demonstrate the kind of creations possible behind the glass of the Gallery. From an oil painting inspired by the South Downs of England in Autumn by renowned Chinese artist Liang Yuanwei, a gold-plated 3D-printed map of an owner's DNA created by the enfant terrible of German product design Thorsten Franck, a hand-made stem of the finest porcelain roses handmade by world renowned porcelain manufacturer Nymphenberg or an abstract design in silk by British artist Helen Amy Murray, the space can accommodate a lot. Even with the Gallery, the driver or chauffeur, as the case may be, would be met with driving functions as a digital screen emerges when the engine switches on, rising in the centre and vanishing when off. Then there are the hand-crafted seats. Behind the wood panelling on the rear of the front seats are the Rear Picnic tables and the Rear Theatre monitors, which are electrically deployed and retracted at the touch of a button. Customers can commission different seating choices best suited to their requirements. 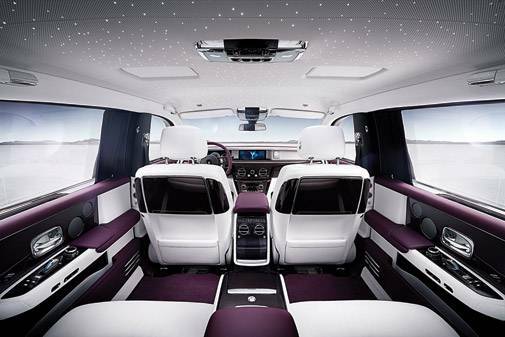 Also new is the fixed rear centre console that incorporates a drinks cabinet with whisky glasses and decanter, champagne flutes and coolbox. When it hits the roads in 2018, the new Phantom will join the list of must-haves for the connoisseurs of luxury around the world.